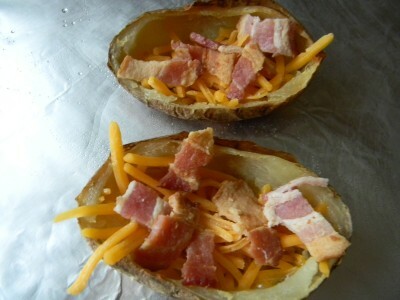 Who doesn’t love potato skins? Look to buy small potatoes. They bake in about 45 minutes and are easy to manage when eating. Make the skins and bacon ahead of time and bake right before you want to serve. Save the leftover potato flesh for skillet potatoes. Start by baking 12 small potatoes at 375′ for 40-45 minutes. Cook the bacon until crispy. Drain over paper towels and cut into small pieces. Set aside. Once the potatoes are done, cool until you can handle them. Carefully scoop out the flesh of the potato. 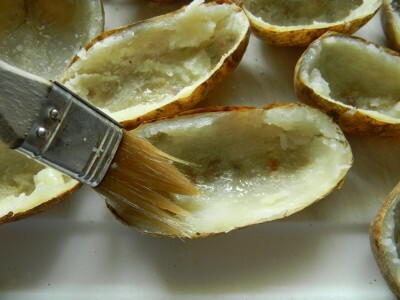 Brush canola oil on the potato skins to coat. Once they’re all coated with oil, season generously with kosher salt. Bake in 375′ oven for 14-16 minutes. The leftover potato flesh will be good for 7 days in the refrigerator. Top the hot skins generously with cheese and cooked bacon. 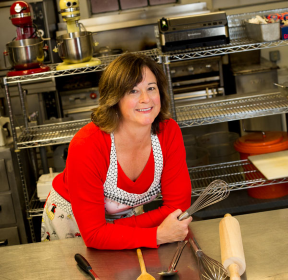 Bake at 375′ another 5-7 minutes. Serve with sour cream and sliced green onions. Enjoy! 1) Preheat oven to 375’. Bake potatoes for 35-40 minutes. 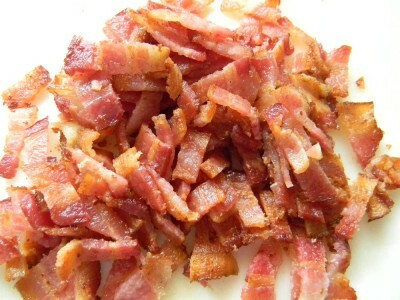 2) While the potatoes are baking, cook the bacon until crispy. Drain on paper towels and cut into small pieces. Set aside. 3) Remove potatoes from the oven and allow to cool until you can handle them. Cut in half and remove the flesh of the potato. Save the flesh for breakfast potatoes. 4) Brush the inside and the back side with a thin layer of canola oil. Season the inside of the potato skin generously with kosher salt. Place on a foil lined cookie sheet. Bake for 15 minutes. Remove from oven and generously top with cheese and bacon. Bake an additional 8-10 minutes. 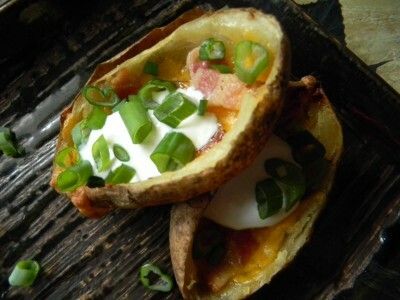 5) Remove from the oven and top each skin with a dollop of sour cream and a sprinkle of green onion. Serve immediately. Makes 24.
Who doesn’t love french fries? Hard to believe that it takes a few basic ingredients to make these. Crispy oven french fries that actually taste like a potato, how original! My kids go crazy over these. Season them however you like. Load up on the garlic or make them spicy with a few pinches of ground cayenne pepper. Either way, guilt free french fries. Zero trans fat. Zero unpronounceable ingredients. Zero deep frying. Enjoy! 1) Line a baking sheet with 1” sides with Reynold’s non stick foil. (this is key) Set aside. 3) Preheat oven to 425’. Thoroughly drain potatoes in a colander, shake them up to release as much water as possible. 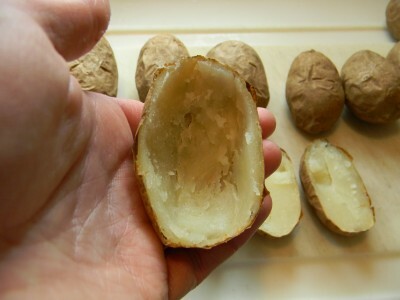 4) Put potatoes into dry bowl. Drizzle 1 tablespoon of oil over, toss. Sprinkle garlic powder, salt, and pepper over potatoes and toss to coat. Sprinkle flour over potatoes and toss to evenly coat. 5) Spread out over cookie sheet without overlapping. 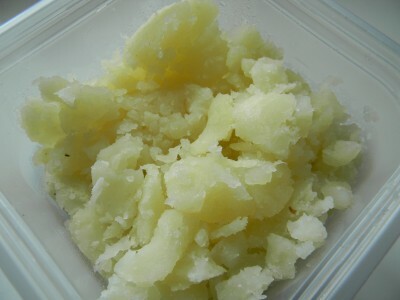 Drizzle remaining tablespoon of oil over potatoes. 6) Bake for 25 minutes, remove from the oven and carefully give them a turn. Place back into the oven for an additional 15-20 minutes or until browned to your liking. Sprinkle parsley over potatoes. Serve immediately. Everyone LOVES fried chicken! This is the easiest way to make a very authentic tasting “fried” chicken. It takes minutes to prepare and it will certainly become a family favorite! Serve for Sunday supper or bring to potlucks! This will be your “go to” chicken recipe. 1) Preheat oven to 400’. Line a cookie sheet (with sides) with Reynolds non stick foil. 2) Rinse chicken and drain well. Season each piece generously with salt, pepper, and thyme. Drizzle chicken pieces with one tablespoon of olive oil, toss to coat. 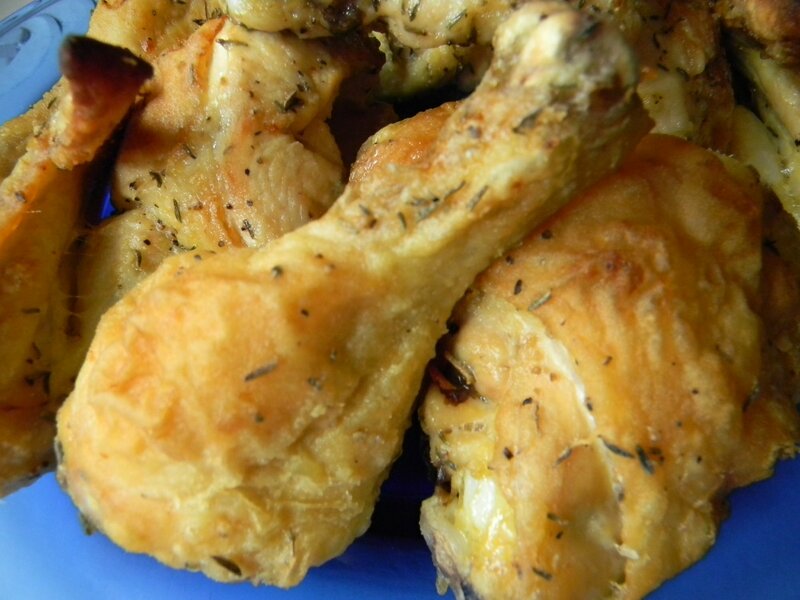 Dredge each piece of chicken in flour and shake to remove excess flour. Place on foil lined sheet. Using a basting brush, baste each piece of chicken with drippings in pan after about 30 minutes of baking. Bake for 45 to 55 minutes. Enjoy! This is a family favorite. If you haven’t used panko bread crumbs before, you’re in for a treat! They make anything you bread light and crunchy. Have your dipping station set up and ready to go. If you care for a little tarter sauce, simply mix together 1/3 cup plain non fat yogurt, 1 tablespoon mayonnaise, and 2 tablespoons sweet pickle relish. Whisk until well blended. Round out your meal with brown rice pilaf and a green vegetable. This will soon be a favorite of your family too! Enjoy. 1) Reynolds non stick foil line a cookie sheet and preheat oven to 400’. 3) You will need three containers to bread the fish. Into the first, the flour. Into the second, the beaten eggs and water. Into the third, the panko crumbs, parsley, and chives, mix well to distribute herbs. 4) Heat a non stick skillet over medium high heat and add enough oil to cover the pan. Working one at a time and in this order, dip each fillet into the flour, then egg mixture, then into the panko. Press crumbs into fish. Carefully place breaded fish into the hot and oiled pan. Cook 2-3 minutes and turn, cook another 2-3 minutes. Remove from pan and place on prepared cookie sheet. Bake for 15 minutes. *note* if you’re making this for a dinner party, prepare the fish all the way to browning. Place in a container and use wax paper between layers and refrigerate immediately. Simply bake for 20 minutes before you’re ready to serve. This chicken is excellent. I love it because it has amazing flavor and isn’t deep fried. Marinating in the buttermilk gives the chicken great flavor and very moist chicken. You can also use chicken pieces with skin and bone, just increase the baking time to one hour. You will have enough of the spice mixture to make the chicken 3 more times, very convenient. Mix all ingredients together and store in an air tight plastic container. Yields ½ cup. 1) Place chicken breasts in a large zip bag, add buttermilk & marinate for at least 3 hours or overnight. 2) Preheat oven to 375’. Line a cookie sheet with Reynolds non stick foil and coat foil with about 2 tablespoons canola oil. 3) In a medium size bowl, mix all dry ingredients together and blend well. One piece at a time, allow buttermilk to drain off chicken and dredge in spice/flour mixture making sure to coat well. Place on prepared cookie sheet. 4) Drizzle about one tablespoon canola oil over chicken pieces. Bake for 30 minutes, with a pastry brush blot chicken pieces with drippings from the bottom of the pan. Bake another 10 minutes. Make this for dinner and it will be in the regular meal rotation in your house. Oven baked and crispy like fried chicken or chicken strips, your family will absolutely flip! Make with chicken tenders or cut the chicken breasts into strips. 1) Preheat oven to 400’. Line a cookie sheet with Reynolds non stick foil. 2) You will need three containers for coating the chicken. Into the first, mix the bread crumbs and parmesan cheese, set aside. 3) Second, beat the eggs and water, set aside. 5) Trim your chicken of any excess fat. Season generously with salt & pepper. 6) In this order, coat the chicken: First in flour, then the egg mixture, and finally the bread crumbs. Be sure you have evenly coated each piece. 7) Drizzle a small amount of olive oil over the foil lined sheet & place breaded chicken on sheet. Lastly drizzle a bit more oil over chicken. Bake for 30-40 minutes or until golden brown and crispy. Serve with a Simple Garlic and Cheese Pasta and a simple salad. YUM! Note: If the chicken breasts are very large, you can slice horizontally, carefully holding the top of the breast with your hand and slicing through the center. You must use a very sharp knife, and be careful. You now have “cutlets,” they will take less time to bake.